You are here: Home / Positions / Our Topics / Economy & Digital / The “doughnut-model” – A compass for managers? The “doughnut-model” – A compass for managers? Growing global risks like climate change and poverty on the one hand and failing economic models on the other hand pose significant challenges to policy makers and managers alike. Overcoming the “divide” between economics and natural sciences, the doughnut model of social and planetary boundaries may prove to be a promising compass for decision-makers of the 21st century. We summarised the model and its author’s policy proposals for information and to launch a debate on how to bring management and sustainable development better together, without judging the adequacy of the concrete proposals. You may also find the presentation from our “leadership of the future” seminar on sustainable leadership strategies, including the doughnut model, on YouTube. 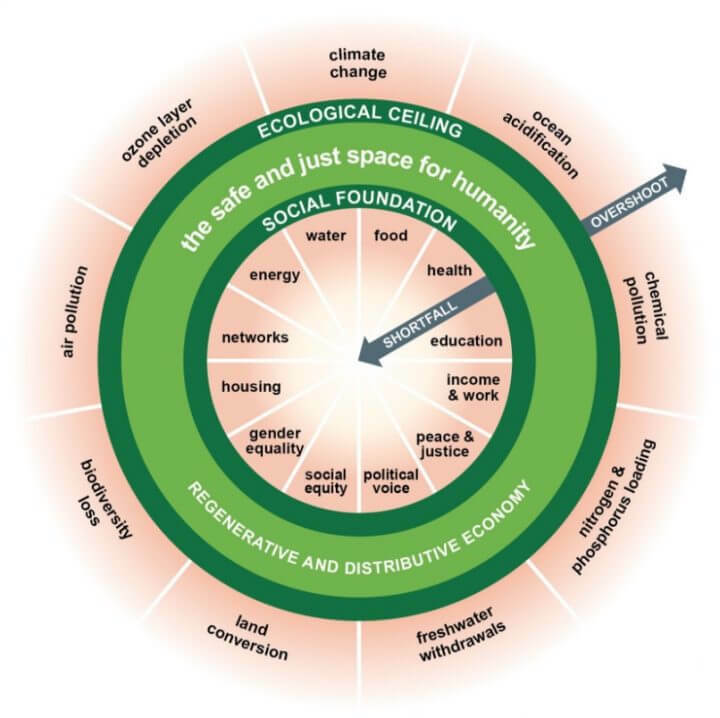 The so-called doughnut (picture, left), set out by the economist Kate Raworth, is a model that systematically brings social and environmental challenges together in order to define the margins of action for mankind. To steer towards more sustainable human development, the model meets two requirements: to ensure a living basis for everyone and to limit pressure on Earth’s life-supporting systems. The environmental ceiling, on the one hand, consists of nine planetary boundaries, beyond which lie unacceptable environmental degradation and potential tipping points in Earth systems. The model includes, on the other hand, twelve dimensions of the social foundation derived from internationally agreed minimum social standards, as identified by the world’s governments in the Sustainable Development Goals in 2015. Shortfalls in the doughnut-hole represent the proportion of people worldwide suffering from shortcomings in life-essential resources, including political ones. The green doughnut itself is the “safe space” in which humanity and its potential can unfold. How did we get to the point of such profound socio-ecological imbalances threatening our very existence? Authors like Wilkinson and Pickett, Piketty, as well as Raworth (picture, right) hint at deeply ingrained inequalities amongst and in the world’s societies. Wilkinson and Pickett argue that inequalities lead to illnesses, excessive consumption, political disengagement and many other social problems. According to Piketty, especially the high returns on capital, exceeding the rate of economic growth and thus creating wealth inequalities, put our societies at risk. The OECD rather suggests that income inequalities have a negative impact on medium-term growth. Independently of the importance dedicated to either wealth or income, many authors grant a central role to a large middle class as the source for economic success. Now, an important aspect of these authors’ approach, compared to 20th century inequality models, is that inequality is not an inevitable milestone of progress, in an enlarged sense, including social and environmental dimensions. 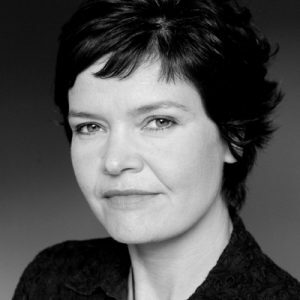 Kate Raworth identifies the need to create economies that are distributive by design, facilitated by network technologies. Besides reducing income inequalities, more characteristic of the 20th century, the author advocates for redistributing the sources of wealth too, above all the wealth that lies in controlling land and resources, in controlling money creation, and in owning enterprise, technology and knowledge. One of the key challenges, according to the authors mentioned earlier, is to link management and business practices to social and, above all, environmental boundaries. To begin with, there is only little information available on the environmental impact of businesses in general and of corporate social responsibility (CSR) practices in particular. Few companies measure their progress in sustainable practices quantitatively and even less publicly. Furthermore, the effects of business action in these domains are seldom linked to what happens in ecosystems. One of the key reasons for this is that systemic thinking, according to Whiteman et al., is absent from CRS studies and corporate practices. If accountability and data innovation are to be increased, companies are likely to need better incentives to make this information publicly available, offering the chance to make this information a source for further innovation at the benefit of our planet. Besides individual practices of companies, the wider organisational ecosystems have to be considered to leverage effective change. Breaking environmental responsibility down to individual companies in a measurable way would require a contextual analysis of the firm and the object for its action, for instance, the sector, the potential impact reduction of a particular dimension (e.g. emissions) and the wider system dynamics (e.g. policy context). 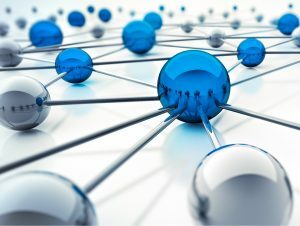 Network dynamics, fuelled by new technologies, could increase business coordination in certain sectors by setting common targets. But here again, design incentives could be beneficial to accelerate initiatives in that domain to guarantee same starting conditions. Furthermore, the question of global governance arises when setting company or sector level targets. Without a binding framework in which companies face the same conditions, incentives to do more in terms of sustainability could remain low. Besides actors in the ICT sector and “green industries”, companies may remain reluctant due to the fear to lose in competitiveness. As noted by Raworth, certain solutions could be found by designing incentives for appropriate behaviour. These could take the form of providing knowledge and capacity building, by incentivising social and environmentally friendly initiatives through financial and fiscal measures or through technological means. In sum, the doughnut-model provides an interesting orientation to policy-makers and managers. Its concrete policy implications, however, remain controversial. You may also want to read ‘How to do business with doughnuts’ from Kate Raworth here. Easterly 2001: The Middle Class Consensus and Economic Development. In: Journal of Economic Growth. December 2001, Volume 6, Issue 4, pp 317–335. Raworth 2017 : Doughnut Economics: Seven Ways to Think Like a 21st-Century Economist. P. 150 ff. Whiteman 2012 : PLANETARY BOUNDARIES: ECOLOGICAL FOUNDATIONS FOR CORPORATE SUSTAINABILITY. P. 3.